contractor you thus save at least 50% of your time, which you can now spend on perfecting your planning or servicing other clients. A dethatching machine combs every square centimetre of your lawn. When doing so, the machine will also bring some stones to the surface. For this reason, the robust frame will protect you against all of the dislodged dirt. ELIET will not take any risks in this respect and has, therefore, decided to use a 3 mm thick plate metal frame that is robot-welded to exacting standards. The working depth is typically 2 mm. At this speed, virtually no braking is applied to the blades so that they can operate at full speed and lift up moss and thatch from the lawn surface. As the blades do not cut through the roots, this greatly reduces the time required by the lawn to recover after dethatching. Accurate and correct depth setting implies a very fine adjustable depth adjustment. To this end, the front wheels of the E600 compactor feature an infinitely variable adjustment. This enables the same depth to be set across the entire blade shaft. At ELIET, we do not use a conventional jockey pulley to disengage the blades, as these pulleys can be a sure source of trouble. ELIET have instead developed “Vertical Belt Tension”. A lever linkage lifts the engine bedplate in order to tension the belt. This allows the tensioned belt to retain its natural shape, thus significantly improving belt life. The two belt pulleys only touch the inside of the belt so that the outside of the belt is not subject to wear. On a professional ELIET dethatching machine, a belt very seldom needs renewing. 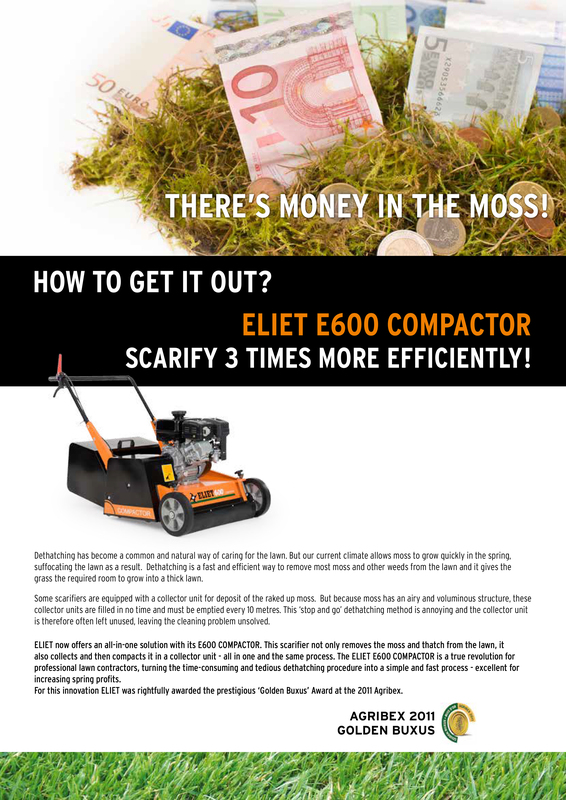 The ELIET E600 Compactor is equipped with a set of Permanently Sharp Blades™. These blades have a working life in excess of 100 hours. Regardless of whether you choose, fixed, oscillating or double cut blades, you still wish to completely use up the blades. Since the adjustment facilities on the front wheels are inadequate, ELIET have also provided depth adjustment at the rear. Work comfort means that you perform the work with a minimum of effort. In this respect, ELIET pamper the operator of the E600 Compactor. Large wheels with light aluminium rims running on tyres with a supple natural rubber tread ensure that this machine glides across the lawn. Each wheel is equipped with two large-size ball bearings. These heavy duty wheels are able to withstand the dusty conditions in which these machines have to operate. The wide wheel tread minimizes the risk of wheel rut formation on wet lawns. If dethatching takes place in the spring on a swampy lawn, the newly raked moss tends to stick to the wheels so that the machines move up and down when crossing the lawn, with this having a clearly visible effect on the result of the raking. To remedy, ELIET have fitted scrapers to the wheels of its professional dethatching machines. Any dirt that sticks to the wheels is immediately removed from the wheels. The patented removal and compaction technique of the E600 scarifier provides the solution to the classic disadvantage of quickly filling collector units. By compressing the moss in the collector unit, the number of times the unit needs to be emptied is reduced. The blade system with integrated paddles does not throw the moss directly into the collector unit but instead deposits it into a funnel made of two counter-rotating conveyor belts. The brush effect and the extra throwing power of the blade system ensure that all moss is projected forcefully and deep into the machine-wide funnel. The counter-rotating belts transport the moss and push it deeper into the funnel, pressing it between the belts. This funnel ends in the collector unit and ejects the compressed moss into it. As the moss has already been compressed, it loses its voluminous structure, which means that the collector unit is filled with material, not air. The two conveyor belts keep pouring new waste into the unit, pushing the waste it already holds further to the back of the unit, allowing the unit to be filled to its maximum capacity. No back-flow of waste is possible, so the compression of the material in the collector unit increases as more material is poured in. Through its more than 20 years of experience ELIET has developed three types of blades, each with their own specific characteristics. Therefore, it is important to choose the blades that best fit the type of lawn that you work on most often. The blade system of the E600 compactor is equipped with 36 Double-Cut™ blades, positioned very closely together. The name refers to the double number of blades over the operating width. These blades are thinner (thickness 1.5 mm) and set in a spiral. This configuration is very useful for golf courses and high-quality grass covers or ornamental lawns. The double cut blades are made from a harder base material. Although they are much thinner, they still keep their permanent points for at least 100 hours. This ensures intensive dethatching during each run with the E600 compactor, raking up a maximum volume of moss. The raked yield is further enhanced by the backward rotating blades. The machine is also equipped with self-sharpening, Permanently Sharp BladesTM, providing a guaranteed yield at all times. Furthermore, the wheel drive on this scarifier ensures a constant forward speed: less tiresome for the operator and yet another timesaver! In order to spare the operator the burden of pushing the machine forward, a roller drive has been installed on the E600 compactor. As a result, the machine rather than the operator mainly determines the operating speed, which again adds to a higher yield in m²/h.